Shattered Moon is a complete system, powered by FateStorm, published by Broken Tower. 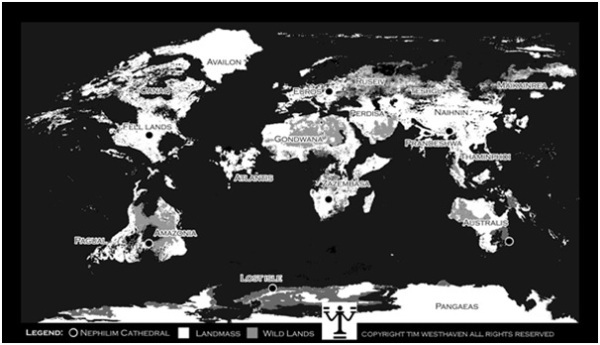 Shattered Moon is a fantasy apocalypse setting, in which the world has been rocked by not only a geological and environmental upheaval, but also a mystical one. Human mythology talks a lot about the disappearance of the magical races, but rarely explains where they went or why. That was my starting point when developing Shattered Moon. 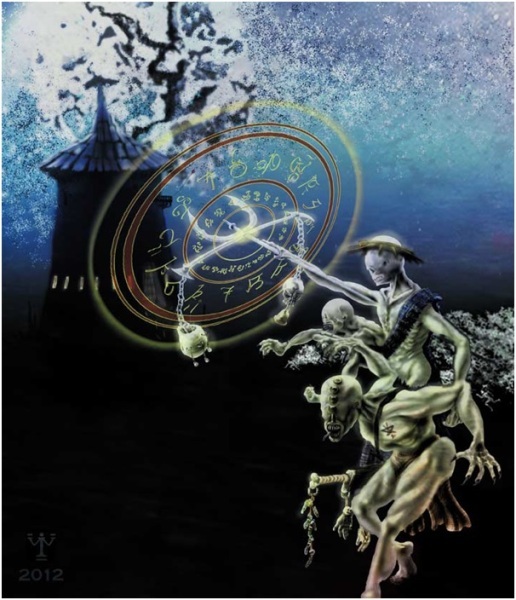 Focusing on the western traditions of fey, going back to the roots of the mythology into faeries and such, there is the notion of the ‘great retreat’; when the magical races disappeared from the world. I turned that on its head – to a ‘violent invasion’ and the thought that just as they disappeared from the world so they might return. The catalyst to this was to be two-fold: first the shattering of the moon and the return of the exiled Goddess Lilith; second, the breaking of Oberon’s seal – a mystical barrier that was the original cause of the loss of magic, and the magical races, from the world as we know it. The first catalyst saw massive environmental and physical damage to the world, great chunks of the moon falling to earth with the force of nuclear warheads, earthquakes, tsunamis, tectonic plate shifts and more. Such global catastrophe left the world a very different one to the one we experience – and would have been more than enough to base a post-apocalyptic setting in, but bring in Lilith and the Nephilim standing beside her and things get even messier. In their rituals to establish control of the earth they break Oberon’s seal and remove the age-old barrier preventing magic from flowing into the world from the outer spheres of existence. This revives the magical races, and brings about a supernatural apocalypse that really puts the earth on a razor’s edge. 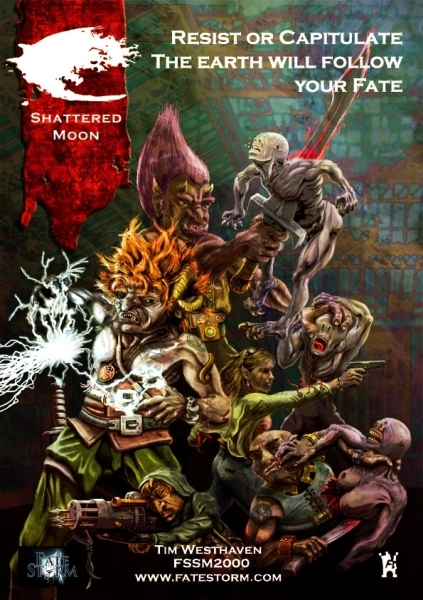 In Shattered Moon, the human survivors are too weak to survive against Lilith and the Nephilim, they just don’t have the magical might to stand against the forces arranged against them, and face too many mundane obstacles that are capable of destroying them regardless (starvation, age, disease, barbarity). So I decided to look elsewhere for their salvation – the NuoSidhe. The nuoSidhe are the playable races in Shattered Moon, they are the transmogrified forms of Sidhe spirits that have been trapped in human bodies and lives since Oberon’s seal was created; dwarves, elves, goblins, ogres and trolls. Previously human in form and consciousness, with the destruction of Oberon’s seal they have changed into their true spiritual, physical and moral form. The nuoSidhe are not without their problems, while they don’t have to worry about aging, disease or even starvation, they are affected by other factors, their need to power their magical abilities through tithe, the rules of the sidhe that dominate their new society and the allegiance to one of the courts; Seelie or Unseelie, that can be cause enough for hostilities between nuosidhe. The earth of Shattered Moon has been rocked by geological, environmental and mystical disasters. 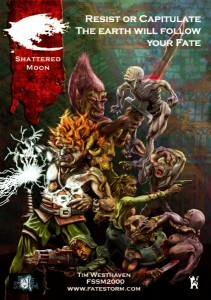 Shattered Moon is not the first game to explore the idea of magic returning to a modern earth, or the idea of characters taking on the role of elves, dwarves or trolls in such a world – but, for the most part, previous attempts to incorporate the idea of the magical races into a modern setting have glossed over the idea of what it means to these characters to be in the new world. And where in other games the idea of a fantasy-apocalypse has seen the use of fantasy races they have really felt like human post-apocalyptic survivors, just in costume; there hasn’t been a real attempt to focus on the mystical aspect of these characters or what that means to their day to day existence and interaction with the wider world. 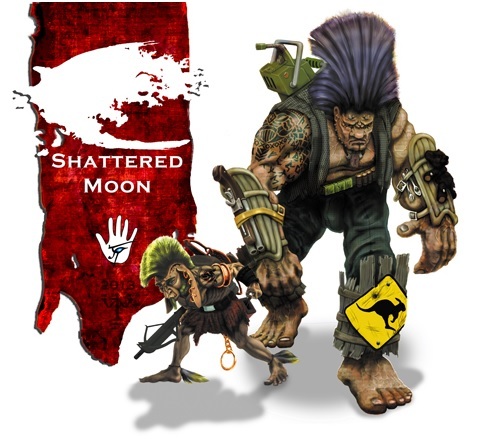 In Shattered Moon, as nuoSidhe, the players are forced to make hard choices due to their race first, their court allegiances second and to the world in general third. And this is what I really wanted to zero in on in Shattered Moon, the personal relationship the characters have with their innate mystical natures. While they have all these supernatural powers, they have to pay a price for them and that price can be high in terms of personal moral and ethical choices. The great thing about Shattered Moon is how it really makes the players think about the environment their characters are in, simply by having to play non-humans with these very non-human abilities and traits. There are a number of supplements already available for Shattered Moon. I’ve always loved reading myths, legends and fairytales and this have been the major influence in developing Shattered Moon. In looking at other influences, the film Labyrinth and the old monster films of my youth, especially those of Ray Harryhaussen, but also modern cataclysm films such as 2012, The Day After Tomorrow, and the Walking Dead series and even the Spiderwick Chronicles. There are dozens of books which I could give as influences, the War of the Flowers by Tad Williams, The dark is Rising by Susan Cooper and Faerie Tale by Raymond E Feist. Two other major influences were Mike Mignola’s Hellboy, and the MadMax films, and one of the ways in which I describe Shattered Moon is like Hellboy meets MadMax or a Grimm fairytale in a MadMax jacket, which really brings the two genres together; imagine Rumpelstiltskin or Puss in Boots, Jack and the beanstalk or Three Billygoats Gruff mixed with the Walking Dead and MadMax and it’s a pretty good melting pot of what Shattered Moon is like. However, I think one of the most inspiring influences on the game was the Count Brass stories by Michael Moorcock. The world of Count Brass leaves a feeling of recognition to the world we know, and yet it is altered in shape and reality to a point of being alien, this altered state with the shadow of a world we know and recognise was certainly an appreciation I wanted to bring to the setting of Shattered Moon. A lot of the concepts and ideas I built into Shattered Moon were there from years of osmosis playing other games and reading, reading and more reading, but there were certainly times that research was called for. While there is little science in the setting of Shattered Moon, I researched what changes would occur to the world if the moon were truly broken apart and shattered – and disappointingly the scientific answer is very little. The moon was formed through centrifugal force and so eventually, even if the moon where broken apart, the pieces that remained in orbit would eventually reform, in addition the combined weight of the moon fragments would not alter the nature of gravitational pull with regard to tides and the like. In theory the moon would have to be obliterated in order for there to be wide spread environmental catastrophe on the earth. So it’s lucky we’re dealing with fantasy and not reality and so I was able to think about tidal shifts, tectonic movements and the mystical influence the destruction of the moon would have on the inhabitants of the world. I carried out research into geological movements of the earth’s crust as well as the fallout from super volcanoes (a number of which were unleashed in the aftermath of falling moon fragments) as well as research into changes in the earth’s temperature and seasons with a change in the magnetic poles. I went over a lot of the old books, stories, myths and legends that I had read as a child, researched a lot into various mythologies representations of fey and faeries and into the story and representations of Lilith, the lilim and the nephilim. And I guess built up a dossier of tales and notes on elves, dwarves, goblins, ogres and trolls over a two-year period. And this research really informed the abilities, needs and personalities of the nuoSidhe races. The first thing most people notice when they look at the pages is the colour. It’s very colourful, algae greens, rust reds, yellows and oranges – in very acidic tones. This sort of disorienting and confronting colour scheme was chosen to give a hint of both decay and magic. The majority of images within the book are in full-colour, with minor images in black line art or greyscale rendering. Almost solely digital, the art has an almost acrylic painterly feel to it while a number of images were created to imitate photographic prints. Overall, the colours are bold to match the page design and the strength of colour and rendering produces an aesthetic similar to modern Asian animation (although not anime). There is high attention to detail, as it is these details which really lift the pictures out of being merely fantasy or post-apocalyptic tropes. I was completing a degree course in illustration while working on this book and that is certainly reflected in the quality of the illustrations. I’m especially pleased that there are clearly defined styles for the races, which builds their unique characteristics and is important in representing the nuoSidhe to the reader. Lilim murders (plural) ravage the landscape, led by the exalted hagris under the direction of the Nephilim. I have always found it astonishing the level of humour that comes out in game play, for a game that has a lot of horror and really tough moral and ethical decisions being made by the players almost constantly. And I think that’s a great thing – it is meant to be fun after all. 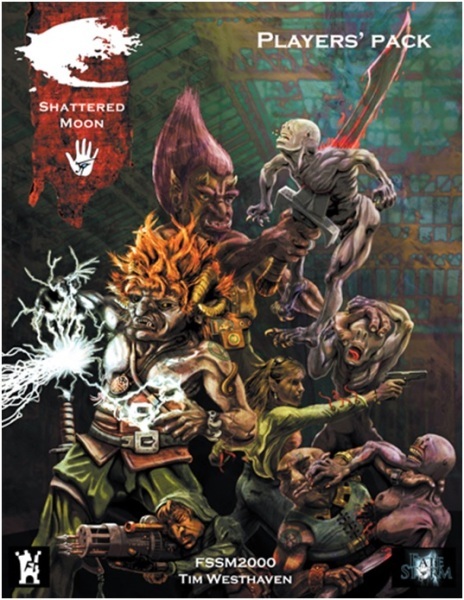 Shattered Moon, at its heart, has a great deal of horrific content, whether that is the players’ avatars doing unsavoury things in order to increase their unseelie powers or witnessing the destruction, social decay and horror of the world around them. 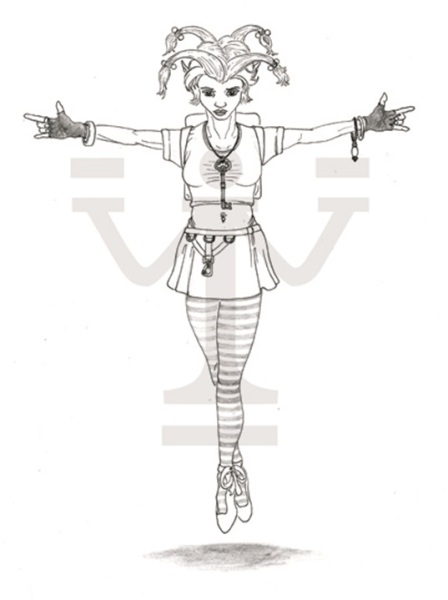 The design of the game, and the nuoSidhe, with their need to renew tithe in order to power their mystical abilities, forces the players to recognise their more ignoble needs as well as fight against a complete collapse in personal behaviour and responsibility. In game testing and in normal play, this has led to a number of stand-offs between party members and even friends in game where morals and ethics are called into question and friendships are put to the test. It is hard enough surviving in the post-apocalypse world of the Shattered Moon, but, as nuoSidhe, the players have other influences to contend with, face and choices to make. Far from being a disruptive element to play, these moments of inter-personal drama really make the game something else – and the troupe develop strong inter-avatar stories and relationships as part of this play style. Even though the players’ avatars are possessed of these supernatural abilities, because they come at a cost and because that cost can not only force them to align with either the seelie or unseelie court but also change their personalities, the players are made to face real consequences for their actions and the powers they choose to use. So while the setting is fantasy-apocalypse, and can accommodate most adventuring styles, it is really the focus on the avatars, their relationships with each other and their personal victories and tragedies that make the game as good as it is. This is a tricky question. I’m not sure what I would compare it with. I guess in some ways it could be compared to Exalted, in that the avatars are powerful and mystically enhanced people. However, while Exalted has many more special powers to choose from it lacks the focus that the racial types in Shattered Moon give, not to mention the strong identities each race possesses. Another comparison would have to be Shadowrun, purely because it is a mix of magical and modern tropes. And in this comparison I think Shattered Moon beats Shadowrun in terms of really developing the identity of the mystical races, and how they interact with the world around them. In Shadowrun (1st and 2nd Ed. as I haven’t played beyond that) the idea of being an elf or a troll wasn’t all that different to being a human, sure you had a few racial modifiers and an allergy but pretty much you could have been a human with pointy ears or really big and ugly, it didn’t really make much difference to the style of play or in the game itself, you grabbed your gear and off you went on the next run. But because I really wanted to focus on the nuoSidhe, their abilities and how they used them, they become focal to the game; and this really comes down to the tithe cost and how the avatars pay for their abilities. Each race has abilities aligned to either the seelie or unseelie courts, also known as the light and dark or summer and winter courts. For most seelie abilities, tithe are acts or objects that we would consider valuable or benevolent. For the unseelie abilities the cost for the most part is fairly morbid – fresh flesh, skin, blood, or bones. And whether it is a dwarf looking to score his next piece of gold or diamond or an Ogre bartering with a human for a pound of fresh flesh (human or otherwise) this need to constantly replenish their tithe drives the game in directions that most other fantasy-apocalypse games do not, and at the same time really drives story and avatar development. From the time I decided to put Shattered Moon together, the whole process took about two years and really flowed together. As I was using the FateStorm VRS, which I’d already produced for Rogue Marshal, the core mechanics were in place, but moving from a renaissance style fantasy setting to a modern setting with automatic and heavy weapons as well as modern technology meant that there was a need for, not only a mechanics review, but also new mechanics to cover modern weapons and technology. I also wanted to address many of the issues that had come up in feedback to Rogue Marshal, including overly complicated avatar creation, lack of a glossary and text issues. So we undertook a full edit and review of the mechanics, streamlining them and really hammering out the rules to be tighter and cleaner. With regard to avatar creation, I introduced templates for each of the starting vocations, and provided guidelines for personalising them. This effectively means, from a players’ standpoint, play can begin almost immediately if they decide to use one of the templates, or within a relatively short period of time with some personalisation. This made a huge difference and was well received by game testers and players alike. Before all this, I had two main priorities; establish the racial profiles and the backstory to the world. The backstory came first. Blending in elements form Assyrian and Sumerian, Greek, Roman and Celtic mythology I developed the story of Lilith, being banished and imprisoned in the moon around the time of the end of the second Titan war. At which point Oberon had already created the seal which cut off the outer spheres of existence to the earth, limiting the amount of magic leaking into the world to a drip. This then required the immortal spirits of the Sidhe, stranded on the earth after the creation of the seal to inhabit other bodies, once their own long lived bodies eventually died. So the elves, dwarves, goblins, ogres and trolls who were stranded on the earth, came to possess human form, and over the millennia forgot who they originally were. Other magical creatures likewise disappeared or went into torpor; such as the titans, giants and mythical beasts of legend. The story of the moon shattering and unleashing Lilith back upon the world was to be the catalyst for the return of magic – but I didn’t want it to be so straight forward, I wanted there to be more conflict and tension in the return, so it was by accident that Lilith and the nephilim break Oberon’s seal; turning the world into a magical sinkhole. Next it was a matter of deciding upon the races that would be available to the players and what powers they would have. I wanted the races to be immediately identifiable, to be really approachable to players and so I chose those that most appeared in the legends, fairytales and myths. As with most of my design decisions I always look for where I can apply more conflict, more pressure on the players to interact, both with each other and the setting, so I split the races up into the high-sidhe and low-sidhe – effectively the management and working class of the sidhe. The dwarves, elves and ogres are the high sidhe, the goblins and trolls the low sidhe. Taking each race in turn I looked at all the abilities, powers and influences mentioned in the various tales and myths, next I decided whether they were innate to the race or whether they were mystical. The innate ones became the racial abilities, while the mystical ones became the races court abilities, aligned to either the seelie or unseelie court. But this decision also came down to which powers I wanted the players to work towards keeping, the ones that would cost tithe. For example, the elf; naturally graceful, they possess the talent of Sidhe Grace – but most tales of elves also speak of their ability to charm and persuade – so this became a court ability on the unseelie side; giving them the power to charm and influence, but at the cost of their unseelie tithe (paid for through vampirism). All the races are very distinct in their special abilities and powers, this is great for creating not only opportunities within games for particular characters to stand out but also for bringing the troupe together to work as a team, taking advantage of their unique abilities. After I’d decided upon the races, their abilities and finalised the mechanics for court abilities, tithe and hoard I spent the better part of a year working on the art, trying to find a unique mix of fantasy and apocalyptic imagery. I had a lot of fun doing this, researching post-apocalyptic fashions and thinking about all the refuse and detritus that a nuoSidhe might pick up along the way and incorporate into their personal possessions – and the tithe of the races certainly came into this, thinking about dwarves walking around with their collection of bones, trolls wearing the skin of their victims and elves collecting the various trinkets they have bartered off people in return for favours. After this period of time, production of the book began in earnest as well as initial game testing. Working on Rogue Marshal had given me plenty of things to think about in terms of trying to ensure production on Shattered Moon went much smoother, and one of the ways I wanted to do that was in the layout of the book. I spent a fair amount of time playing around with the layout, trying to come up with the most logical and beneficial arrangement of information. There were two parts of the book that were in constant use during gameplay, the assea weaves and the resource pages. In laying out the book I thought the best place to put one of these most used sections was right at the back of the book where it would be easy to find, but it didn’t make any sense placing the weaves away from the chapter on assea and assea weaving. So I set the resource pages to the back of the book. The front of the book is setting heavy, focusing on the return of Lilith and the reappearance of the sidhe in the form of the nuoSidhe. This segued into a breakdown on the nuoSidhe and the racial profiles and from there into avatar creation. After that it was a matter of laying down the system and mechanics after which the book is focused on the Fate and tools for telling the stories, including the story cast (npcs and bestiary). The text underwent over three detailed edits, which took a great deal of time but was well worth it, streamlining and ironing out some of the more nuanced concepts in the FateStorm VRS. But perhaps the most time-consuming process was in generating an index. For such a large book and with so many unique elements, the index generation (which I did manually) took a number of weeks and was a real test of endurance to get done, so I do hope it proves useful. Overall, the end result is one I’m very proud of and happy with. It is a very strong product in terms of gameplay, identity and style and it was important to me that the files were print ready (which meant much longer production time and exacting design standards) so now the book is available in soft- and hardcover versions. The hardcover version is just amazing and still fills me with pride that I was able to bring it to fruition and realisation. With the great result I’ve had with the game, the strong support from the game testing teams and customers, I’m well into producing the supplements. The first, Ogre pledged and devout, came out a few weeks ago and the latest, Elf aesir and vex, is out now. I’ve got a list of other supplements on the go, including goblin, troll and dwarf racial vocations, titan profiles and more monster templates. While these supplements are my first priority, I am also working on a module and will hopefully have it ready for publication soon.